Quinn Madden has played the most minutes among Lions freshmen. After Emerson went from tied with WPI to down 13 on Saturday, freshman guard Quinn Madden took over. With less than two minutes to play in the fourth quarter, Madden first made an aggressive drive to the basket, scoring and drawing a foul, and then converted from the free-throw line to complete the three-point play. On Emerson’s next offensive possession, Madden’s up-fake fooled WPI forward Maura Buckley, leading to an easy jump shot. 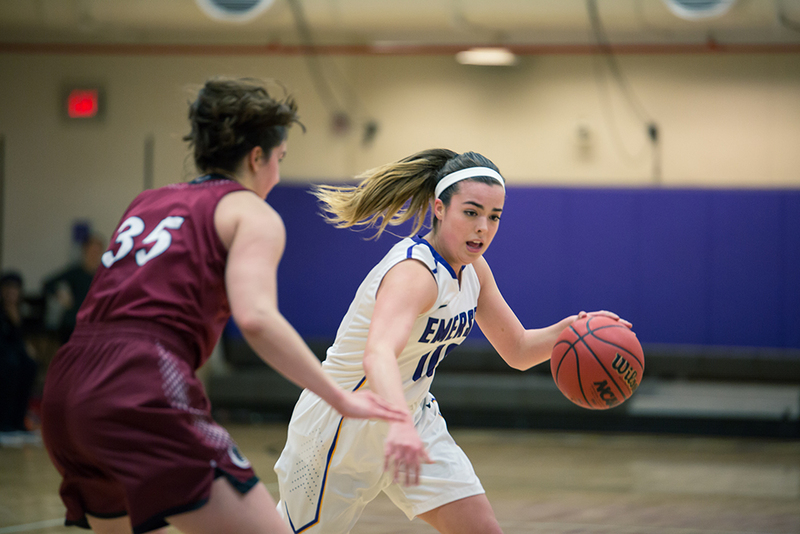 While the comeback would go no further, and Emerson (8-10, 2-8) eventually dropped a 56-43 decision to the Engineers, Madden’s 10-point afternoon tied her with Charlie Boyle for the team lead on the day. Madden is one of five freshmen who has played impactful minutes for Emerson’s women’s basketball team, and the Illinois native is frequently the first option head coach Bill Gould turns to off the bench. Gould said Madden’s versatility has stood out. “She can play any of the guard positions and she even at times is physically strong enough— if any of our posts are in foul trouble—she could even defend a post, so she’s just a tough kid,” Gould said. Madden said she took what worked in the Lions’ 71-45 loss to WPI on Jan. 10 and used it to her advantage in the rematch. “We found success in the last game when we were driving, so I was trying to do more of that so we could maybe get on a roll with it a little bit,” Madden said. Madden is averaging just under 20 minutes per game. Fellow freshmen Natalie Clydesdale and Kate Foultz have also seen strong playing time, and Leena Kardacz and Kenna McCafferty have received regular minutes. Gould said he encourages his first-years to do some introspection at their old stomping grounds over winter break to come back with a better understanding of what they’ve accomplished. Emerson shot 1-of-16 from three-point range against WPI, its worst performance in the category this season. The team has attempted the second most threes in the conference, converting just under 30 percent overall. Last year, current senior guard Elizabeth Horan finished second in the conference, making over 39 percent of her threes, while now-junior Eastin Ashby finished seventh. While both Ashby and Horan have seen a slight decline in their statistics, Gould said it’s consistency that Emerson lacks in the deep game. The Lions’ best shooting night from beyond the arc came on Wednesday night in a 64-57 loss at Coast Guard. The team shot just under 39 percent on threes, with junior Maya Savino knocking down three of her four attempts. Gould said NCAA women’s basketball’s switch to four quarters from two halves, approved ahead of last season, has had minimal impact on Emerson a year and a half in. Because of the new format, opponents are now considered in the double-bonus (two shots when fouled) once a team has picked up five fouls in a quarter, rather than ten in a half. There is no one-and-one (if the first shot is missed, there is no second) like in men’s basketball. Gould said that part of the switch makes it seem a lot easier to reach the team limit in fouls, which can have an impact toward the end of games. Gould said the end of the first and third quarters, which he considers “built-in timeouts,” also help him to manage players with foul trouble. Eastin Ashby’s 47 steals are eight off her career-high of 55 last year with seven games to play. She is averaging 2.6 thefts per game, fourth-best in the conference. Emerson will meet Fisher on Saturday in the Bobbi Brown and Steven Plofker Gym in its final non-conference contest this season. Tip-off is set for noon.